The MT-C7001 is a learning model developed to facilitate the study of the component parts of a vehicle’s air conditioning circuit. It can also be used to learn about how to perform maintenance operations such as emptying/refilling the circuit with refrigerant. The circuit is filled with HFO-1234yf, a refrigerant whose use has been made mandatory by European directive 2006/40/EC for mobile air conditioning systems, phasing out the use of HFC-R134a.ÊUnlike HFC-R134A, neither the purchase of new HFO-1234yf fluid nor its handling requires a training attestation, a formal record of the work, or an annual declaration to the approved body of volumes emptied and filledÊ(Article R543-75 of French environmental law). The compressor in the air conditioning circuit is driven by an electric motor which simply requires connecting the model to a 230 V, 50/60 Hz mains power supply. The MT-C7001 model can be transported easily and is supplied in a transport and storage case constructed specially for it. The electrical test points provided on the model’s front panel are used to validate the expertise acquired by the trainee by assessing his or her ability to troubleshoot a problem. 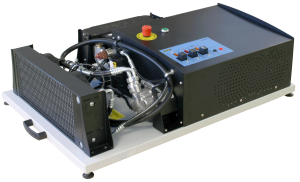 The MT-C7001 model features the new electronic fault generating device which lets the trainer trigger different faults typically encountered with automotive air conditioning system. The iBAP device can be controlled by a PC app or by a mobile device with WiFi capability.